If you need new gutters for your home in Minneapolis, Minnesota, or any nearby community, turn to the professionals at DuBois ABC Seamless. We install gutter systems that are made from seamless steel, and because we manufacture our products right on site, they are custom-made to fit the exact dimensions of your home. Plus, we use highly trained installers to make sure that your new gutters are properly formed, cut, and fastened to your home, creating the finished, unified look you desire. They’re seamless, which means the opportunity for leaks is virtually eliminated. 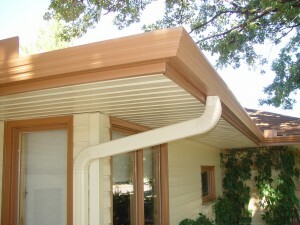 Steel gutters never need painting, won’t dent like aluminum, and won’t crack like vinyl. Our gutter system is secured to your home using our proprietary “heavy” hangers, which are stronger than conventional hanging systems, reducing the possibility of your new gutters pulling away from the roofline under heavy loads, like accumulated ice. The gutter styles we offer are designed to blend effortlessly into your home’s soffit and fascia system, creating a cohesive, unified look that results in gutters that are virtually invisible. In addition, our gutter system is designed to carry away 33 percent more water than a standard gutter, reducing the opportunity for water infiltration around your foundation and, potentially, into your basement. When you add our Hurricane Leaf Protector™ gutter covers, you will ensure that your new gutter system does not become clogged, which means you will never have to worry about cleaning your gutters again, or about water spilling over the edges of your gutter system and rotting your roofing materials. Contact DuBois ABC Seamless to learn more about our gutters, gutter covers, and other outstanding exterior renovation products. We have proudly served residents of the area since 1980, and are honored to be trusted by so many homeowners in Minneapolis, MN, and throughout the Twin Cities.